Monkfish is also known as anglerfish or goosefish. It grows to a length of more than 150cm and to a weight of more than 30 kg, But a medium sized one (around 10 kg) tastes best. The body shape is flat as if it were pressed down and about one third is the head. It has stern eyes and a big and wide mouth.The jaw never releases the fish which it swallowed whole.It looks ugly but dignified. Despite its frightening exterior, monkfish has a mild,sweet taste.The flesh is dense and similar to scallops or lobster meat. The monkfish lives in water up to 1000m deep. This strange fish lives along the ocean floor,eating almost anything that comes near. They are equipped with a “lure” which is a stalk above their head which they skillfully use to attract prey close enough to swallow. 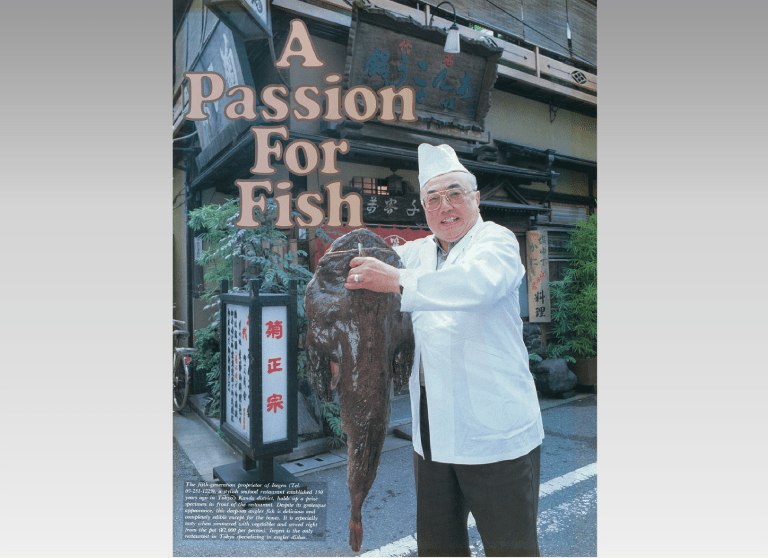 Monkfish was eaten by the common people in the Edo Era. It was very popular. 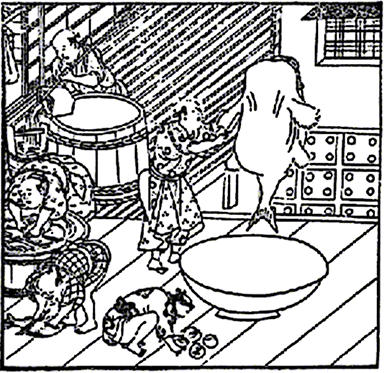 People in the Edo Era loved and were interested in eating. They spent most of their money on food.They also had excellent appetites and looked for various kinds of foods. Monkfish was very popular with common people,because all the parts of the fish except the bones were edible and had a very good taste despite its frightening exterior. We can eat all the parts except the bones and devide the fish into 7 parts. ・ tail meat　・ liver　・ skin　・ egg　・ stomach　・ fin　・ cheek meat They have different tastes and textures. Monkfish’s body is so big,soft and slippery that it’s hard to cut on a chopping board. So we use a traditional cutting method called “Tsurushigiri”.We hook the jaw and hang it,and we pour a lot of water into stomach and then we cut off each part of it. We go through a rope in an underlip of fish, hang on a transverse beam and also pour five or six measures of water into a stomach by a big dipper from the mouth. We wait the water to overflow the mouth in outside and die away, cut off an integument of the neck throat almost and peel good and bad of a personal appearance up gradually, again, and, water takes a liver, cuts up a gut and cuts off a bone after we return and cut up a fin in the two vicinities and meat around up, and when a stomach is stuck by a sword at the end, runs out, so We’ll wash a kitchen knife and leave immediately. If Monkfish is cut up recklessly without knowing this law, a leather body puts on flesh, and enterohepatic breaks, and isn’t used any more. Monkfish liver is known as the foie gras of the sea. It has a very rich taste and a smooth texture.It contains IPA,DHA,VitaminA,D,E and a lot of minerals.Because of this it reduces the cholesterol level in our blood and raises our immunity to disease. The gelatin of the skin contains a lot of collagen and it will make your skin beautiful. The tail meat is a high-quality protein and low-fat food,so it’s very healthy.